^ Albee, A., Arvidson, R., Palluconi, F., Thorpe, T. (2001). 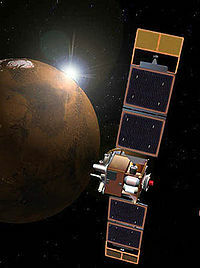 “Overview of the Mars Global Surveyor mission”. Journal of geophysical research 106 (E10): 23291–23316. doi:10.1029/2000JE001306. http://trs-new.jpl.nasa.gov/dspace/bitstream/2014/16090/1/00-1989.pdf. ^ Malin, M.C., et al. (1991). “Design and Development of the Mars Observer Camera”. Journal of Imaging Systems and Technology 3: 76–91. http://www.msss.com/mars/observer/camera/papers/moc_ijist/moc_ijist.html. ^ Malin, M.C., et al. (2006). “Present-Day Impact Cratering Rate and Contemporary Gully Activity on Mars”. Science 314: 1573–1577. doi:10.1126/science.1135156.